According to the plan for preparing for the accreditation of the department “Clinical Disciplines 2” for the 2018-2019 academic year at the department monthly 4, 5, 6, 7 standards for specialized accreditation of educational programs were discussed at the chair’s meetings. On February 9, 2019, the responsible teacher for No. 4 standard A. E. Omurzakov at the cathedral meeting No. 7 informed the teachers of the department about the general provisions and criteria for evaluating the standard “Student admission and recognition of educational results and minimum requirements for graduates”, which consists of 6 criteria, gave a description of each of them, highlighting the specific and consistently applied rules governing all periods of study, admission, academic performance, recognition and certification, a contingent of students. Also, at the meeting №8 on March 2, 2019 academic year, J.A. 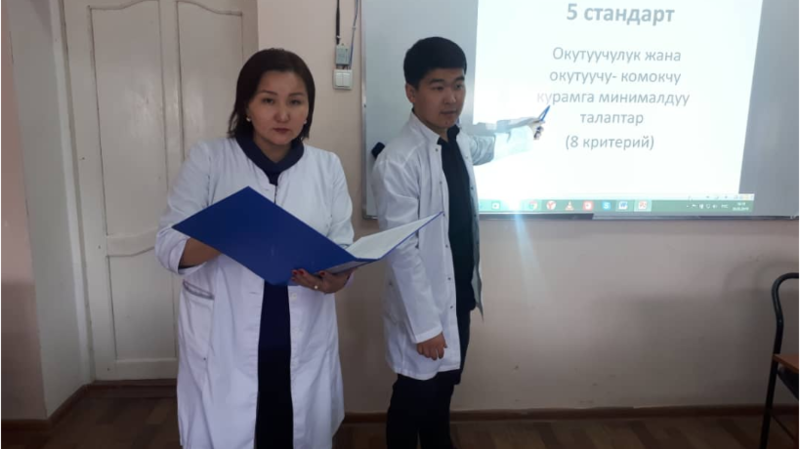 Abdirasulova, responsible for standard 5, informed her colleagues with the general provisions of the “minimum requirements of the teaching staff”. During the discussion, J.A. Abdirasulova outlined the personnel policy for the formation and development of the teaching staff of the EP, the creation of favorable conditions for work and the analysis of the relevant documents defining job responsibilities, professional development and professional development, the use of teaching staff of innovative methods and training technologies. In addition, on March 25, 2019, at the cathedral meeting No. 9, the next interpretation of the sixth standard was conducted under the guidance of G. J. Osmonova and A. Z. Tuibaev, responsible for this standard. The teachers spoke about the general provisions of the “educational resource and student support system” and 9 evaluation criteria, noting the guarantee of a sufficient number of educational resources and student support services that are available and consistent with the goals of the EP and the improvement of material and technical bases is a factor in ensuring the quality of education of the EP. The final discussion of the latest standard number 7 was held April 8, 2019 at the cathedral meeting number 10, where VD Tursunov is responsible. Explanation No. 7 of the “public information” standard, which consists of 5 criteria, noted the role of demonstrating public information about its activities, conditions and characteristics of the implementation of the EP. In all the cathedral meetings, teachers actively participated in the discussion of 4, 5, 6, 7 standards and expressed their own opinions to strengthen and improve the work on standards. Thus, the staff of the department got acquainted with all the standards of preparation for the forthcoming independent accreditation, complementing the department documents on the relevant standards criteria.